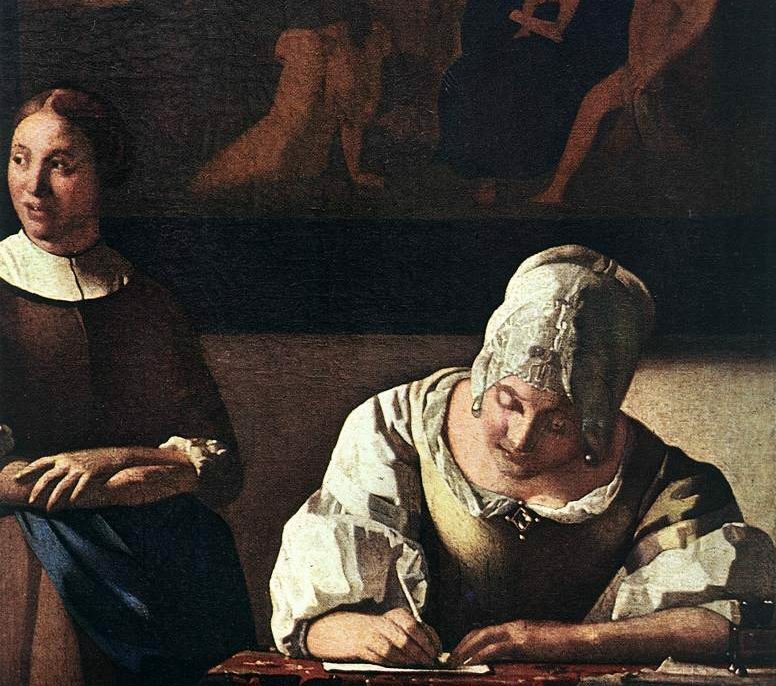 Johannes Vermeer, Lady Writing a Letter with Her Maid (detail), c. 1670. Wikimedia Commons. In an era in which “fake” and “alternative” revisionist truths and falsehoods proliferate in public discourse, Said’s argument is more relevant than ever. As scholars, and intellectuals, the responsibility for representing truths may seem like a no-brainer to historians. Yet public history and what John Tosh has labeled “practical historicism,” or “applied history” in policy-making still largely remains in a category separate from the academy. We teach our students to be critical thinkers and engaged citizens, but are in danger of failing to engage effectively in public conversations. We face danger from multiple fronts. First, from persistent assumptions held within the academy that somehow critical distance and objectivity are anathema to engagement and politics: that historians somehow stand “outside” of history, and that “relevance” means “bending one’s research to the fickle fashions of the day and by extension the dereliction of one’s primary obligation to scholarly objectivity.” Aside from this are the practical professional concerns: junior scholars’ vulnerability on an uncertain academic job market, faculty’s increasing helplessness in universities where tenure revocation has become more than anecdotal, and a creeping general climate of distrust of specialists and academics that makes public voices – especially those most marginal and marginalized – easy targets for both cyber and real-life violence. Standing up and speaking out can have real consequences for an intellectual’s career and life. Yet, as Said reminds us, this has, to an extent, always been the case. Scholars’ voices can be made to be heard in a number of ways. We write op-eds and public articles for popular media sources. We lend our expertise to museum exhibits, give public lectures, write blogs, and create and engage in broad conversations (and debate) on social media. What if we imagined a new forum – a more precise civic voice? “Dear Mister Prime Minister” is nothing new, but in an age in which democratic institutions seem to be facing attack from all fronts, I want to suggest corresponding directly with our elected representatives not only gives us an additional way to apply our expertise in the service of truth, but more broadly, offers us an opportunity to make use of more parts of our democratic system. Last month, in the wake of breaking news about family separations along the southern border of the United States, I looked to my Canadian colleagues for support. A Canadian citizen, I did my graduate studies and taught and researched for years in the US, and like many Canadian scholars, so much of my intellectual and personal world has felt transnational. A researcher and instructor of early 20th century European Jewish history and the Holocaust, I got caught in the vortex of media and commentary with no concrete idea of how to respond from my home base in Canada. My feeling of horror and helplessness was lifted by my Canadian scholarly mentors’ calls to write our MPs and the Prime Minister to make our voices heard. A number of us picked up our pens and postage stamps, and even shared our letters on social media. Our networks reacted and picked up their own pens. Whether as an engine for more political engagement in Canada or an act affirming international solidarity, it became clear to me that this genre of public – indeed, civic – scholarship deserves a place on the palette of public, or even applied history. The following five letters, collected in the last weeks of June and early July 2018, are a record of a special kind of scholarly engagement. We also reprint Susan Joudrey’s letter template that circulated on social media for reference and inspiration. These letters evoke our professional expertise, years of research and teaching, our understandings of Canada’s role in the world. They also reveal glimpses of our personal backgrounds and emotions, and our enduring commitment, both personal and professional, to the universal principles of which Said spoke in his Reith lectures. Yet this correspondence, written purposefully by one human being for the eyes of another human being, is also evidence of our belief in the mechanics of a healthy democracy, an act in the good faith that our elected representatives and office-holders are truly aware of their roles, the way we are (and should be) of ours, as citizens and as intellectuals. Perhaps this collection will also serve as an experiment – a repository for the voices willing to engage in this kind of civic scholarship, not as policy-makers, activists, editorialists, or bloggers, but as active and engaged citizens as well as scholars aware of and confident in our expertise, authority, and commitment to truth. If you have a letter to an elected representative you’d like to share here, please share them with me at erin [dot] corber [at] gmail [dot] com. Erin Corber is a Montreal-based historian of modern France and modern Jewry and a research associate of the Institute for Canadian Jewish Studies at Concordia University. She earned her PhD at Indiana University, Bloomington in 2013.
asylum seekers, and specifically with the practice of detaining children without their parents. this practice because it violates international law. I’m sure (or I hope) that you have already received several letters like this one, urging you to speak out on behalf of our country against the separation of families of asylum seekers at the United States border. This letter in particular comes to you from a professor of Holocaust and Genocide Studies, as well as Religious Studies, with what I would have thought might be a unique perspective on this humanitarian crisis. However, the public has drawn many of the same terrifying conclusions as I have. It does not take my expertise to recognize the fact that we have seen these actions before, performed by governments that we now write and teach and learn about. We also now write and teach, and learn about those governments and individuals who co-existed at the time. It’s this latter category that seems to puzzle us more. Why, we ask, did these governments and people not stand up against this inhumanity. I implore you to not allow our country, who shares a border, and much more, with the United States, to take this place in the history books my children will read about this pivotal point in history. As we approach our nation’s birthday celebrations, let’s do so in knowledge that we are responsible citizens of the world. I am writing to you today to express my deep concerns over the recent events in the United States, regarding the so-called “zero tolerance” immigration policy that has resulted in the devastating separation of children from their families. Leaving aside the real reasons for such a policy, as it is clear that it has less to do with securing borders than it does with securing political leverage, the consequences of these actions violate international law and ethical standards that all democratic nations abide by. I encourage you to speak out, clearly and vigorously, against this policy. While I understand the need to approach the relationship with our southern neighbour with some delicacy, we cannot stand by as the Trump administration continues to rip children away from their families and detain them in cages. The Nuremberg Principles, established in the wake of the Second World War and the Holocaust and subsequently reinforced by various UN Articles, make it very clear that not only are there international laws to which all nations must adhere, but also that the enforcement of domestic laws, when unethical and contrary to international law, is a crime. Even if the Department of Homeland Security is, as Sec. Nielsen claims, simply enforcing laws that are on the books, the separation of migrant children from their families contravenes the UN Convention on the Rights of the Child. However, it clear that there is *no* federal law in the US requiring the separation of children from their families at the border. Please speak out against these human rights violations. It is essential that the US administration understands that its allies will not stand for such vile behaviour. As a historian of the Second World War, I see terrifying similarities between this situation and that which paralyzed European nations in the 1930s. When the National Socialist regime enacted laws that persecuted German Jews, other nations looked away, for fear of meddling with another nation’s domestic policies. When concentration camps were expanded to house the thousands of people who had been arrested because of these new laws, other nations did not speak out, for fear that their own practices could be the next target of international furor. When Nazi Germany expanded eastwards, marching into other sovereign countries, other nations did nothing, thanks to a misguided sense that Eastern European politics were really in “Germany’s backyard” and of no real consequence to the western world. Obviously, for the sake of this letter, I must simplify the reasons few countries spoke out against Hitler, but I hope you understand the substance of my message. It can be hard to speak out and there are sometimes real consequences for doing so, but Canadians need their leadership to take a moral stance on this issue. I urge you to condemn this policy in no uncertain terms and to think seriously about adjusting US-Canada relations until these human rights violations are stopped. This is something we do when other countries violate international law – why should the US be held to any less of a standard? Finally, I urge you to suspend the Safe Third Country Agreement, until we can be certain that asylum seekers in the US will actually be safe. I am writing to strongly protest, under no uncertain terms, the inhumane and unethical treatment of migrant children in the US, and the US administration’s justification of their actions. I am also writing to urge you, Mr. Prime Minister, and our government, to take a harder stance and a harder language with regards to Canada’s position on this issue. As a scholar and teacher of Jewish history and the Holocaust, I am appalled to see, hear, and read about the policies being implemented by US border officials and the network of collaborators responsible for separating children from their parents and detaining them in what can only be described as children’s jails or concentration centres. I use the word “collaborator” very deliberately. The example of the Holocaust should remind us that the only way these kinds of policies can be implemented is with the enthusiastic, tacit, and passive support of planners, police authorities, border patrol, local politicians and policy-makers, and an enormous swathe of ordinary people willing to support or look the other way. With every fibre of my being, I refuse to join those looking the other way. We have seen this American administration dehumanize refugees, trivialize their circumstances, condone discrimination against them, and now, continue with their policy of attacking them outright. Even worse, we are now watching state authorities and these policies’ architects explain and justify the pursuit of these policies as “law,” muddying the murky waters this administration continues to pollute with falsehood; blaming the Obama administration, or the Democrats, interchanging “law” and “policy”, misconstruing Biblical proscriptions, and casually throwing around “legal loophole” vocabulary. The use of dehumanizing language and the identification of all refugees with MS-13 is deplorable. We need to drown out this noise. Now that the US has announced it will withdraw from the UN Human Rights Council, tactics like this to deter and dehumanize refugees in moments of their complete vulnerability and weakness can be pursued with even more vigor. Our government’s refusal to take a hard stance on the Trump administration’s policies suggest the preservation of NAFTA is a greater priority than the safety and humane treatment of families and individuals at their most vulnerable. This is most certainly an issue worth making political. The US is simply no longer a safe country for migrants at this time, and our government must characterize it as it is and must start accepting and welcoming refugees from the US. Our policies and language about what is happening must change. During the 1930s, Hitler and his expanding empire were able to accomplish their goals in Germany and in new territories in large part because those who opposed his policies on Jews were not willing to make the hard choice and call him out on it. These were hard choices, indeed. As national governments and leaders, organisations, religious communities, and individuals judged the benefits of compliance as outweighing their costs, the project expanded and grew momentum. The Nazi regime and its machine grew confidence, beginning with the brazen shrugging off their international commitments to peace by leaving the League of Nations. By the time Nazi German policy had precipitated a veritable Jewish refugee crisis, most countries had not only shut their mouths, but closed their doors. I am sure many of your constituents have approached you with harrowing and heartbreaking personal and family stories of trauma from this period. As a Jew, I have grown up with these stories within my community. But I am also a historian, and instead of sharing a personal story, I choose to share a document. I attach a PDF transcription of the final plea entered by Adolf Eichmann at his trial in Jerusalem in 1961. Eichmann, one of the principal architects of the Holocaust, responsible for the deportation of hundreds of thousands of Jews and Roma to killing centres across Europe, was tried and found guilty for crimes against humanity and war crimes, and consequently executed. I welcome you to peruse this short document, but I understand you are very busy. Please allow me to use Eichmann’s final plea which I assign and teach every year to every single university class on the Holocaust at schools at which I have taught in the US and Canada, to illustrate a point relative to what we are seeing today. Throughout his trial, which lasted for months, Eichmann employed the excuse that he was only following orders. He claimed he was not a committed anti-Semite and had no personal political motivation in his role at the centre of the annihilation of the Jewish people (actually, recent scholarship has uncovered evidence demonstrating this was a lie). And he was not guilty of these crimes, he points out in this final plea, because the guilt lies with the political leaders – those who he said gave the orders. “I am guilty of being obedient,” he explains. “I never had the power and the responsibility of a giver of orders.” Furthermore, when faced with these accusations and the testimony of survivors, he blamed his former colleagues for throwing him under the bus, and the media, for lies and exaggeration. Hannah Arendt, the political philosopher and a German Jewish refugee from Nazi Germany, herself, reported on the trial for the New Yorker. Her reflections have become vital to the understanding not only of the complex mechanics of the Holocaust but of perpetrator mentality in general. Arendt used Eichmann’s bureaucrat persona and his excuses of “following orders” as a model for what she described as “the banality of evil.” The bureaucrat, the policy enforcer, the onlooker – are all complicit in this crime. They all have their role, and they perform it. Whether motivated by ideology or by some other sense of duty, or even apathy, what we observe today on the part of every *tiny* piece of this deplorable system of the detention and imprisonment of migrant children begs us to return to the question of individual and collective responsibility highlighted by Arendt’s analysis and Eichmann’s own words. The Nazi regime was able to cover its heinous acts by legislating racism and persecution, eventually murder. Yet on the ground, individuals and offices pursued policies under the law that allowed for evolution, latitude, and creativity, murderous innovation, even. Eichmann and his career benefited from this momentum, as did many committed Nazis and their collaborators, when they made their personal and professional choices. On the other hand, it took great courage to see beyond the smokescreen of Totalitarianism and recognize racism, persecution, and immorality. It took courage for individuals and organisations and even some governments to resist and protest these policies and the legal system that facilitated them. We cannot forget that resistors also made choices – often exceptionally difficult and scary ones – in opposing a massive machine of dehumanization and murder. If we buy into the falsehoods and lies used to justify these policies and if we choose to look the other way as administrations and collaborators rework and repeat the atrocities of the past, we will surely one day ask ourselves (or find ourselves being asked) what role we had in the face of them. As Canadians we must observe carefully and act accordingly to make sure that our friends in the US and abroad know and remember our values. I want to thank you for any positive action you have taken on this issue and urge you to stand strongly against, and to adopt a harder language regarding these policies and the Trump administration’s justification of them. The Honourable Ahmed D. Hussen, P.C., M.P. Shortly after Donald Trump took office as president of the United States in January 2017, there were calls on you from citizens as well as organisations such as Amnesty International to rescind the designation of the United States as a “safe third country.” The effect of this would be to allow people arriving in Canada from the United States to pursue a refugee claim at a regular port of entry in Canada. Since that time, the Trump administration has continued to enact policies and issue executive orders along the lines of those that provoked the initial call to allow people crossing into Canada from the U.S. to apply for asylum in Canada, including the repeated attempt to ban all visitors from certain majority-Muslim countries. Illegal border crossings have also increased, with a spike last April, as immigrants, refugees and those without status in the U.S. justifiably fear the raids and deportations carried out by ICE under Trump. A few recent developments make maintaining the Safe Third Country Agreement with the U.S. untenable and also confer a responsibility on Canada to act in the face of egregious human-rights violations in the U.S. First, the policy of family separation at the American southern border is horrifying. Today, the U.N.’s top human rights official described family separation at the border as “abuse” and called for it to be stopped immediately. Apparently children are being pulled away from their mothers while breastfeeding, parents aren’t given an opportunity to comfort their children and some are told that their child is being taking away for a bath, only to discover later that the child will not be returned. According to Rep. Pramila Jayapal (D-WA), women are being told by Border Patrol agents that their “families would not exist anymore” and that they would “never see their children again.” There is seemingly no system in place to reunite families. Parents have been deported without their children and some young children have been deported without their parents. Apparently asylum seekers are also being subjected to this treatment, which is in violation of both U.S. and international law. Accordingly, refugees and other immigrants in the U.S. have legitimate fears that their rights will be violated. It should be easier for them to make claims for asylum in Canada. Secondly, the Trump administration has rescinded DACA, the programme that allowed those who were brought into the U.S. without documentation as children to have legal status and work authorisations. Eliminating this provision after DACA recipients have provided identifying information to the government has obviously led to credible fears of deportation. When combined with the reports and images of longstanding residents, sometimes pillars of their communities, being apprehended and deported with their families left behind, it is understandable that undocumented immigrants in the U.S. would feel the need to seek asylum in Canada. A woman from the Philippines comes to the United States on a work visa in the 1980s and overstays. She is arrested and deported. A few years later, the woman marries an American citizen and returns. On her naturalization form, she deliberately does not disclose the previous deportation, and eventually earns U.S. citizenship. Twenty years later, when the fingerprints from her first deportation are digitized, the woman is notified she will be stripped of her citizenship for lying on her application forms. Furthermore, the Trump administration is considering plans to target legal immigrants who make use of public benefits when adjudicating permanent-residence applications, even if those benefits were for the immigrant’s U.S.-citizen children. This is a radical departure from rules that have existed since 1999. Trump has also revoked the temporary protected status of tens of thousands of immigrants from Honduras, El Salvador and other countries. Some of these people have lived in the U.S. legally for decades and now face deportation. All of this is to say that refugees and other immigrants, legal or undocumented, living in the U.S. have legitimate reason to fear grievous rights abuses and harsh treatment, some of which violates U.S. law and international agreements to which the U.S. is a party. Their search for protection in Canada is justified. This can only mean that illegal border crossings into Canada will continue and increase, placing new burdens on an already overtaxed system. It is my understanding that ending the designation of the U.S. as a safe third country would mostly eliminate irregular border crossings, as it would allow claimants to apply for asylum at Canadian ports of entry rather than having to do so from within the country. It would also make migrants less vulnerable to scammers who seek to exploit them. I read about your proposals to modernise the Safe Third Country Agreement with the U.S. It seems as though biometrics would help border officials make more informed determinations, as you say. But I think the U.S. president’s continued escalation of anti-immigrant rhetoric and policies that target the most vulnerable calls for at least a temporary suspension of the Safe Third Country Agreement or any other measure that would make it easier for victims of the Trump regime to find protection in Canada. We should do whatever we can to push back against wrongheaded and cruel U.S. policies and stand up for human rights and international law. I look forward to hearing your thoughts on this matter. Comme beaucoup d’autres Canadiens et Canadiennes, je suis indignée par la situation actuelle concernant l’application cruelle des politiques sur l’immigration aux États-Unis. Les dirigeants américains se fichent des Droits de la personne. Le Canada doit prendre position contre ces actions. Nous avons accueilli des réfugiés syriens au cours des dernières années; pouvons-nous offrir à ces familles l’occasion de venir au Canada ? Il faut plus que des paroles. Les États-Unis ne sont plus un tiers pays sûr. La xénophobie de leurs dirigeants dépasse les bornes. Les relations diplomatiques avec le président sont peut-être déjà mauvaises sur le plan économique, mais tant qu’à se battre, autant le faire pour des êtres humains. Edward W. Said, Representations of the Intellectual: The 1993 Reith Lectures (New York: Vintage Books, 1996), pp. 3-23. John Tosh, Why History Matters (Basingstoke: Palgrave Macmillan, 2008); and John Tosh, “In defence of applied history: The History and Policy Website,” History and Policy, 10 Feb 2006.